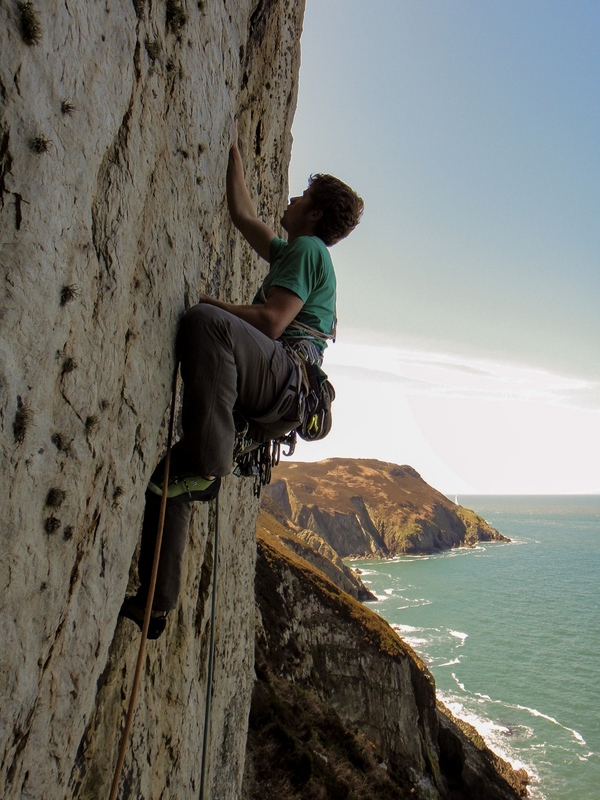 Since returning from Kalymnos I’ve been really keen to get out trad climbing in Wales. The weather’s been totally crap but between showers I’ve been heading out everywhere and anywhere that might be dry. Last week I got out climbing with Ed Booth who came over on a brief visit from Shropshire. 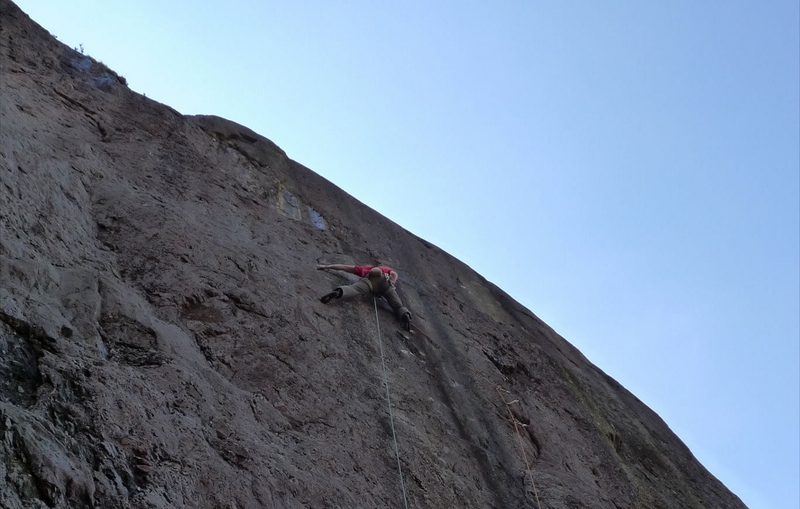 We went climbing at Caseg Fraith, a small climbing venue near Ogwen where we went to attempt an E7 arête called Nemesis. Ed gave it a quick top rope and it quickly became apparent that it was a dangerous and un-protectable proposition but with some very good climbing. I was feeling good though and decided to go for it only to slip off the very first move! I was so annoyed with myself for falling off I got straight back on and got up it quite easily on my second go. Ed then nipped up it easily and like me found the very top a bit scary as the footholds were lichenous! Nearby I’d been told that there was an unclimbed highball slab that Nick Dixon had tried briefly. I thought it was worth a look and I quickly worked out a sequence that seemed to work. Unfortunately the constant light drizzle that had been pestering us all day increased in intensity finally making the slab too wet to climb. I returned a couple of days later and finished the line off on my third attempt. I hadn’t put much thought into the finish of the route which joins an E4 and it was quite scary without a rope or spotter! 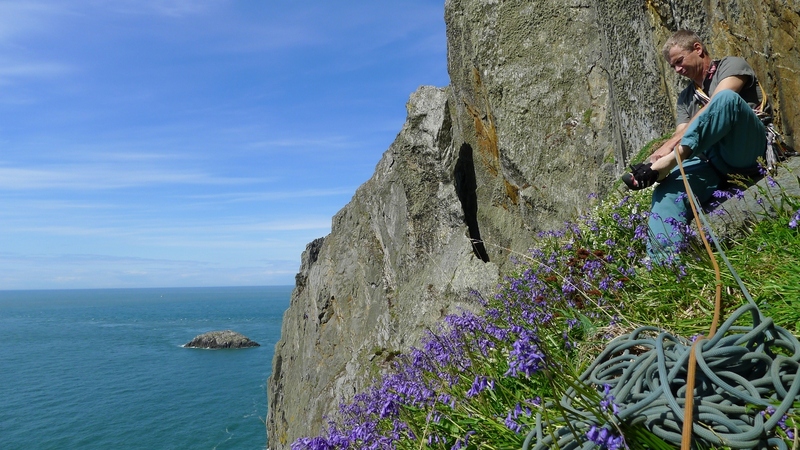 I’ve also made a few trips to Gogarth in the last week climbing some classic routes like Barbarossa, the Cruise and Citadel. I was also pleased to on-sight a classic E6 on Main Cliff called Alien which has a bit of a reputation for spitting off any would be ascentionists. I was surprised to find it quite steady and I think the main reason for its reputation is that people have tried the route in greasy conditions that are synonymous with that section of the Main Cliff making the route a considerably more difficult proposition. 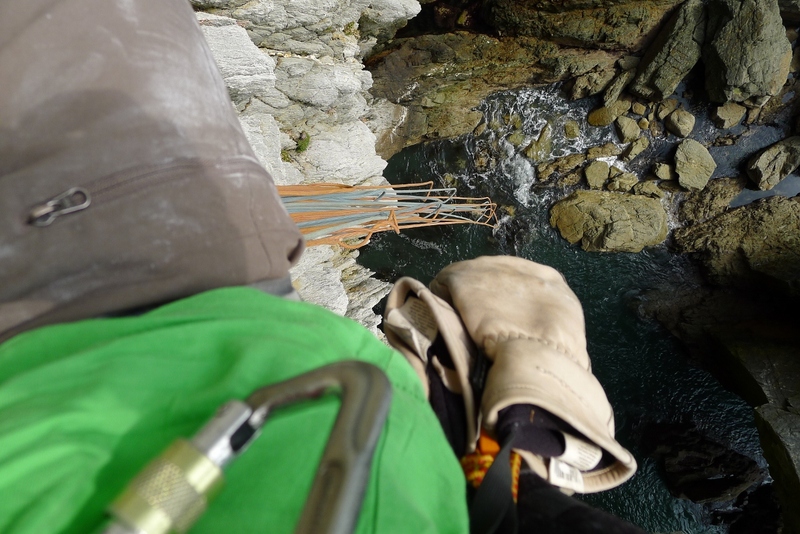 Another fun day was had climbing Mister Softy with Steve Long on the daunting back wall of Wen Zawn at Gogarth. I’d heard rumours of really strenuous climbing on very loose rock but was again happy to find the climbing straightforward and well protected although the rock certainly wasn’t above suspicion! On the belay I placed nine pieces of gear before I was happy that I was safe! The main route I tried recently though was the (in)famous Quarryman. I attempted it with Dan McManus with whom I’ve planned to go to Yosemite this Autumn. Now I don’t think either of us were expecting the route to be a pushover but something worth realising is that it’s not a one pitch route! We were keen to try the route in good style so I went for the on-sight of the first pitch and it took quite a bit of time to work out the sequences amongst all the promising holds. There are some sizeable run-outs too, some of which are quite dangerous and thought provoking! I fought my way up through the crux and then up above the last bolt to the final hard move only for some optimistic smears to ping off and send me flying at least 50 feet down the wall! Far enough for the bolt to pull out half a centimetre! I pulled back up the rope and lead to the top but it felt a little disappointing after all that effort. Dan impressively managed to flash the first pitch climbing it very smoothly and didn’t seem to struggle too much on any move. Then you’re onto the second pitch which has an unusual but very basic pull off a crimp and then you’re landed beneath the groove. The groove for me felt like a big struggle low down, chimneying up frictionless slate before a well earned rest and an easier but extremely cool bit of bridging up the top of the groove. This pitch defeated us both and our feet were aching too much to properly attempt the final pitch and actual crux move. We returned two weekends later feeling a bit more optimistic about succeeding on the route. The first pitch felt more intimidating the second time around and the run-outs hadn’t got any shorter. Dan’s foot unfortunately popped off at the crux and he wasn’t keen for more. I climbed the pitch as quickly as possible to trying to forget about the fall and found myself hastily pulling up to the belay ledge! We both did the second pitch quickly and we were beneath the groove. I gave it a brief go and decided it wasn’t to be that day but Dan rose to the occasion and led the pitch after a couple of attempts. The top pitch was also (not surprisingly!) difficult with a thin crux just high enough above the bolt to make it a little bit intimidating. We both gave it a go and both failed. I decided I’d give it one last go and despite struggling up the easy bit the crux felt reasonable and I made it to the top. Dan was unfortunate enough to split his tips on the crux move and couldn’t really try it after that. Between us we managed the Quarryman that day but we both need to return to it soon to finish off a pitch each. We just hope that climbing El Cap will feel easier when we try it this autumn! 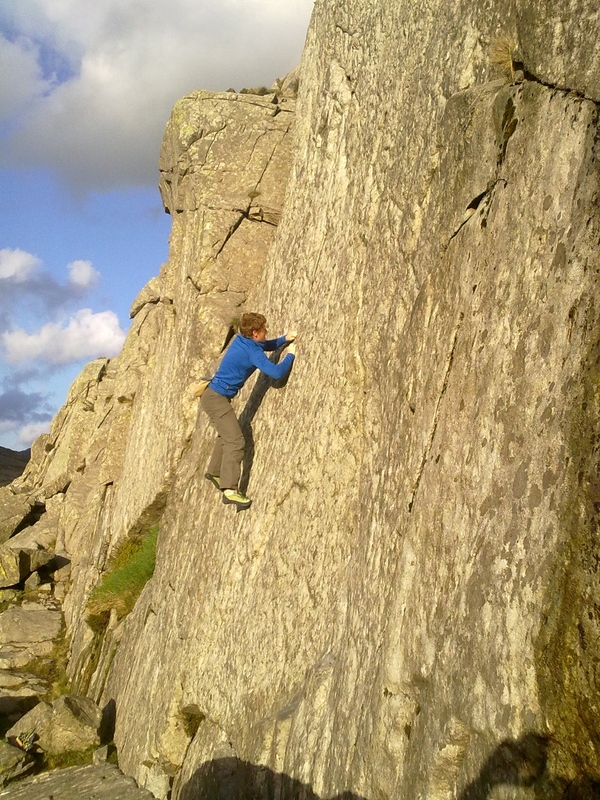 Last but not least I climbed a new route on the worryingly named Suicide Wall at Ogwen. It came as a bit of a surprise really as I was feeling knackered having worked a morning shift and was thinking about going along mainly to give Ed a belay. When I reached the crag however I felt a bit more energized so thought I’d check out a line that I’d previously noticed which gave a pleasant and run-out E7 6b on the perfect side pulls and pockets that make Suicide Wall fairly unique in North Wales. It’s my fourth and most likely final new route on this wall and I’ve had a lot of fun searching out the new lines and repeating routes up there and only have a couple more routes to repeat on the crag which I’ll hopefully finish off sometime soon. 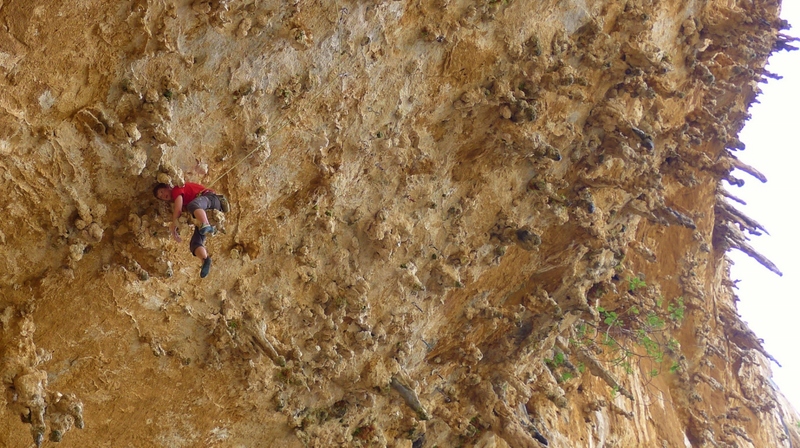 I’m off to the Verdon Gorge next week so hopefully all this trad climbing will have put me in good stead for the long run-outs and scary drops found there! About a month ago I received a text from Colin, an old friend of my parents, asking if I would be keen to go on a sport climbing holiday to Kalymnos. I’d heard about how good the climbing was in Kalymnos, how beautiful the beaches were and how nice the weather was there so it seemed like a no brainer. In North Wales the weather’s been dreadful, I haven’t been able to try my projects at all because of the rain (and snow! 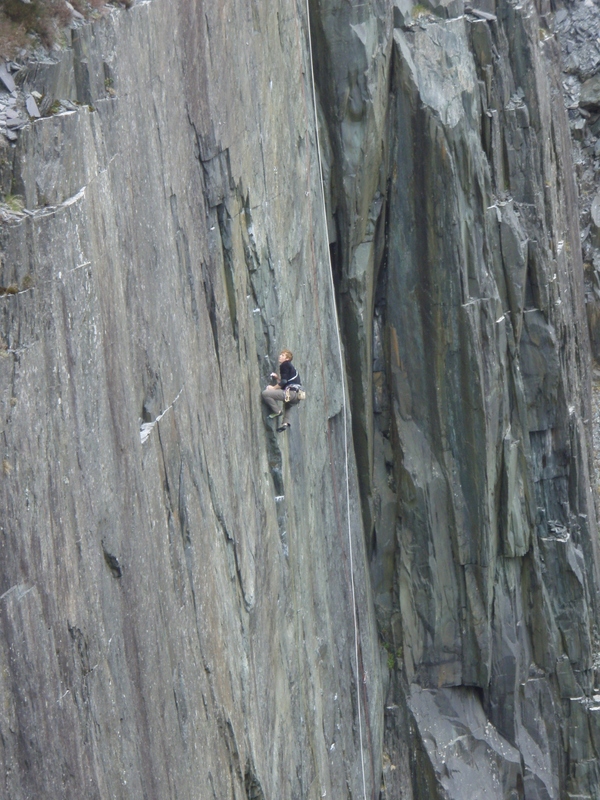 ), and I even got hot aches rock climbing at Ogwen last week! So I was more than happy to be going on a holiday to a sunny Greek island. Despite having good intentions of getting really fit before going, all I seem to have been doing of late is bouldering, which isn’t great when the vast majority of sport routes in Kalymnos are longer than 30m in length! So I wasn’t overly optimistic of climbing very hard when I got to Kalymnos and was just looking forward to a nice relaxing holiday with some climbing. 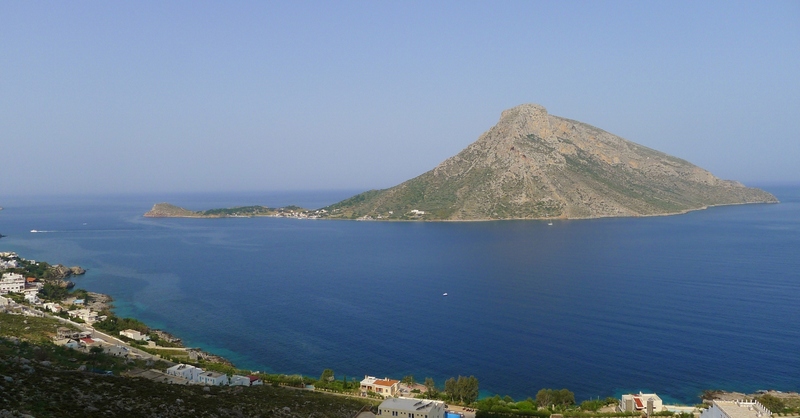 The first thing I noticed about Kalymnos when I arrived is that it had a really nice, relaxed, seaside atmosphere unlike any other climbing destination I’ve been to and very different from your typical Spanish or French sport climbing destinations. 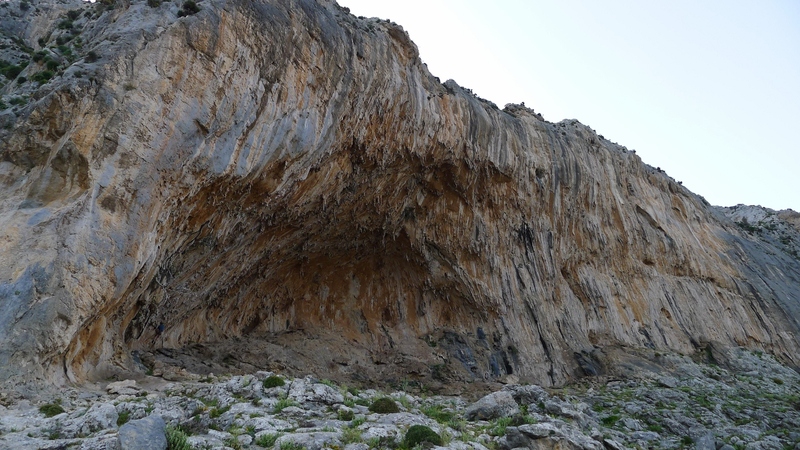 The first crag we saw was the Grande Grotta, Kalymnos’ premiere crag. It looks pretty amazing from a distance as you can make out all the stalactites hanging from the roof like grapevine. But it isn’t until you walk underneath it that you realise its scale. As a cave itself it’s big and impressive, but with “its million year old stalactites” it’s something else. 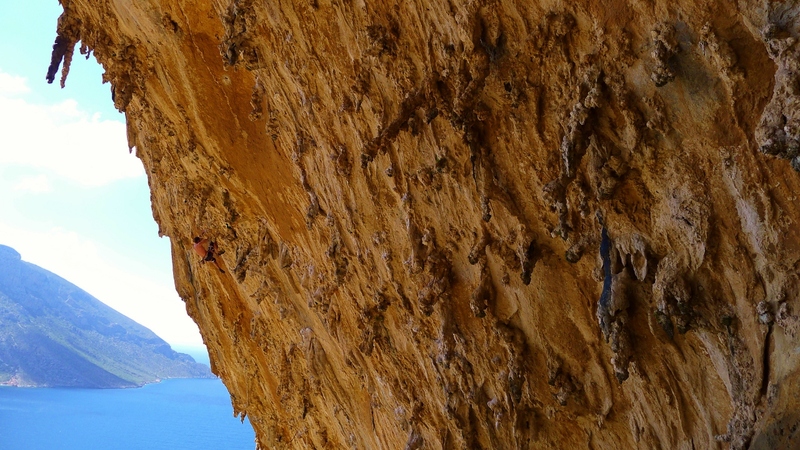 My first route in Kalymnos was DNA, the most amenable route up the main section of the cave which ascends 20m up to a lower off amongst a sea of stalactites. 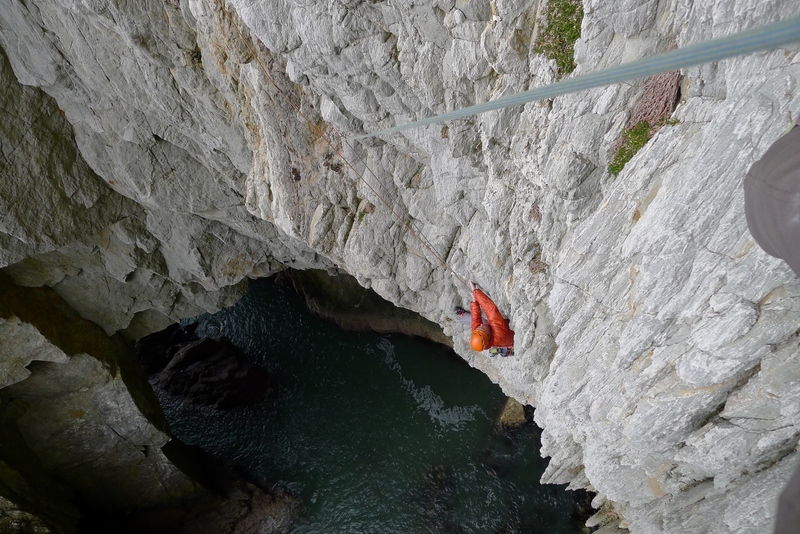 An amazing route which illuminated the quality of climbing the island has to offer. The first couple of days were spent checking out some of the different areas around the Grande Grotta and Odyssey areas where we climbed some brilliant routes of all grades which were mainly very featured with tufa’s and stalactites requiring a creative style of climbing. On the third day with weary arms we plodded back up to the Grande Grotta where I decide it was time to have a go at one of the big routes of the cave, a 40m stamina fest called Priapos. It felt just as intimidating setting off on this as it would up a big wall! The angle of rock just seemed so steep and long that it made free climbing seem improbable but fortunately the holds were massive and the rests were ridiculous- straddling stalactites, upside down kneebars and spacey bridges. Although all the climbing was easy it took a certain amount of ‘hanging in there’ and skills at finding rests to reach the top. 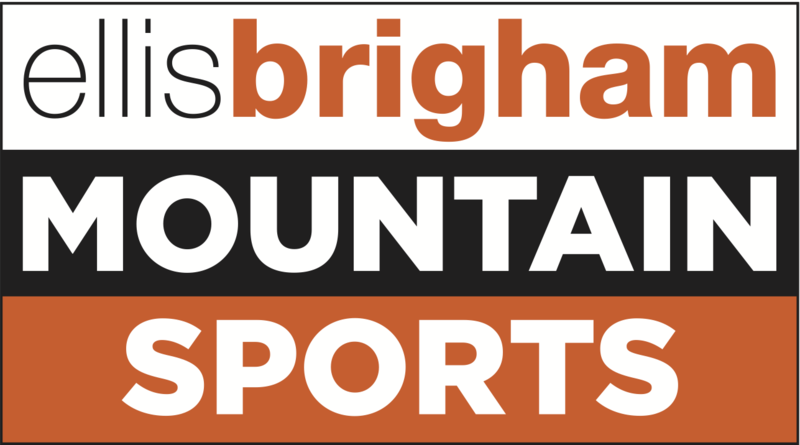 It’s undoubtedly the best sport route that I’ve ever done. It was so overhanging I had to second it to get all my clips out! Buoyed up with my success and amazed at the quality of the climbing in the cave I decided to have a rest day and return to try a longer, steeper and harder route. The route I chose is called Fun de Chichunne and ascends 40m up/into the grande grotta. Generally I’ve always been wary of climbing roofs as I know that my arms quite quickly reach a point of irretrievable meltdown. But I thought that I might just about be able to find enough rests amongst the stalactites to keep the pump at bay for just long enough to clip the chains on this one. My optimism however was short lived after getting very pumped after the first 10m of climbing and I was struggling to get my knees into an awkward and painful jam amongst two stalactites (3/4 length trousers are de riguer for this stuff). After resting for as long as my knees could tolerate I climbed quickly upwards to probably the hardest move on the route except the blob of rock I was hoping to use was soaking and unusable. By this point I’d almost given up hope of getting up this route but I managed to pull off some wacky footwork using a totally different sequence and just managed to slap my way across to an uncomfortable sitting position on a stalactite. I think I spent half an hour sitting here trying to recover and the rest of the route was a similar story to what came before, skipping clips, being unable to chalk up and resting for as long as possible in all the cramped and awkward positions the stalactites force you into. I seriously thought that I was about to fall off at least six times but I eventually got to just below the chains where I was faced with yet another ‘more awkward than it looks move’, I wasn’t going to throw away the previous 40m of hard won effort though and I made the final move and clipped the chains a very happy and exhausted man. This is my first 8a on-sight and probably the hardest of the 8a’s that I’ve done, so I’m very pleased to have managed it as it’s been a lifetime ambition of mine. The final day of the holiday was spent climbing more classic routes and swimming and sunbathing on the beaches. I’d highly recommend Kalymnos as a destination for any climber or non-climber and I’m sure I’ll be returning at some point in the future.